Caulking compounds are sealing compounds used for preventing air or water entry into buildings through door and window cracks or joints. A caulk is a soft, putty-like material made from various chemicals. Caulking Compound Poisoning is the accidental or intentional intake of the compound. What is Caulking Compound Poisoning? Caulking Compound Poisoning may be also referred to as Caulking Compound Toxicity. What are the Causes of Caulking Compound Poisoning? What are the Signs and Symptoms of Caulking Compound Poisoning? The signs and symptoms of Caulking Compound Poisoning can vary from one individual to another. It may be mild in some and severe in others. Several systems of the body, such as the vascular system, digestive system, respiratory system, nervous system, and ENT may be affected. How is First Aid administered for Caulking Compound Poisoning? Who should administer First Aid for Caulking Compound Poisoning? 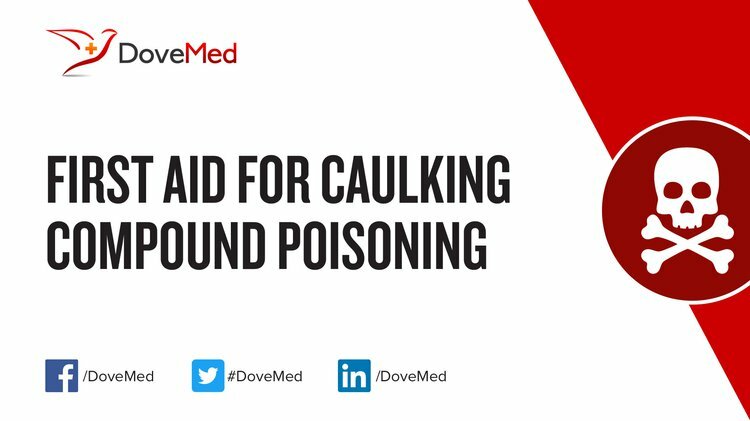 First aid for Caulking Compound Poisoning is administered by healthcare professionals. What is the Prognosis of Caulking Compound Poisoning? How can Caulking Compound Poisoning be Prevented? Okun, J. D. (2011). PCBs in Building Caulk: Health Hazard or Regulatory Overreaction?. In Proceedings of the Annual International Conference on Soils, Sediments, Water and Energy (Vol. 16, No. 1, p. 6). Billings, L. A., & CMH, J. P. (2013). Keeping Mold at Bay. Alternative Medicine, (10), 38. Scott, M., & Snyder, R. (2015). PCBs in construction materials: Old chemical, new context. Environmental Claims Journal, 27(3), 244-263. Bartlett, J. A., Brewster, M., Brown, P., Cabral-Lilly, D., Cruz, C. N., David, R., ... & Morefield, E. (2015). Summary report of PQRI workshop on nanomaterial in drug products: current experience and management of potential risks. Macomber, C. S., Christ, J., Wang, H., Pivovar, B. S., & Dinh, H. N. (2013). Characterizing leachant contaminants from fuel cell assembly aids, a prelude to effects on performance. ECS Transactions, 50(2), 603-618. Massolo, L., Rehwagen, M., Porta, A., Ronco, A., Herbarth, O., & Mueller, A. (2010). Indoor–outdoor distribution and risk assessment of volatile organic compounds in the atmosphere of industrial and urban areas. Environmental toxicology, 25(4), 339-349. Virta, R. (2011). Asbestos. John Wiley & Sons, Inc..